Humans have a natural preference for lighting that shifts to a warm amber color as it dims. We all feel it during a beautiful sunset, or as we gather around a campfire. In this article, we’ll take a look at how warm dimming works in different light sources, some of the historic challenges with warm dimming in LEDs, and new opportunities to create this effect with greater efficiency and effectiveness. “Warm dimming” refers to a light source’s gradual shift from a cooler “daylight white” at higher levels of brightness, to a warmer, amber color at lower light levels. Not only do we find this cozy glow so appealing, scientists such as the Dutch physicist Arie Andries Kruithof, have set out to prove this concept through their own research. Why is warm dimming a historic challenge for LEDs? Traditional light sources, such as the incandescent lamp, are blackbody radiators—just like the sun. This means they absorb all the radiation that strikes them, and emit an equal amount of radiation based on their temperature. As electrons flow through the filament of an incandescent lamp, it’s heated due to resistance properties of the metal. Gradually, as the temperature rises, the filament begins to radiate energy in the visible spectrum—and begins to glow. It starts at an amber color, and as the temperature rises, it moves towards a more neutral white and further to a blue-white at higher temperatures. By contrast, most LEDs retain their cool color temperature as they dim, producing a gray effect that’s cold and muted rather than warm and amber. This is because LEDs are semiconductor devices — not blackbody radiators like incandescents. A typical white LED is composed of a blue LED with a yellow phosphor coating. White light is created by mixing blue light from the LED with yellow light generated by the phosphor. As this typical white LED is dimmed, it simply produces less blue and less yellow light. The white light is the same color, there’s just less of it. Therefore, the light source does not change color temperature as it reduces intensity which results in a flat colorless dim. Clearly, this is not the desired effect when dimming lighting to create ambience. Full spectrum LED solutions like Ketra produce a warm amber dim. Unlike typical LED lighting, Ketra generates white light by combining multiple, saturated red, green, and blue primary light sources with a phosphor converted white LED. Because we combine the white LED with varying amounts of red, green, and blue light, Ketra’s white light can be gradually adjusted to match the dimming curve of a traditional light source, such as an incandescent lamp -- shifting to a more amber color as it’s dimmed. The result is a warm dim curve that is pleasing and natural. Not all tunable LED systems can produce a warm dim. How is the dimming effect created? How many channels or colors are mixed to create white light? Is it a two-channel tunable white system or is it full spectrum? Does it warm dim at all? If you are evaluating tunable white LED systems as well as full spectrum LED systems, it is important to understand the differences between them. While they have some dimming capability, tunable white systems typically create a warm dimming effect by mixing together two color channels such as a warm white LED and a cool white LED. In this scenario one can tune the color between two color points, such as 5,000K and 2,700K. However, it is impossible to go any lower than 2,700K. To get a real warm dim effect, the light source should be able to go down to 1,400K and lower. 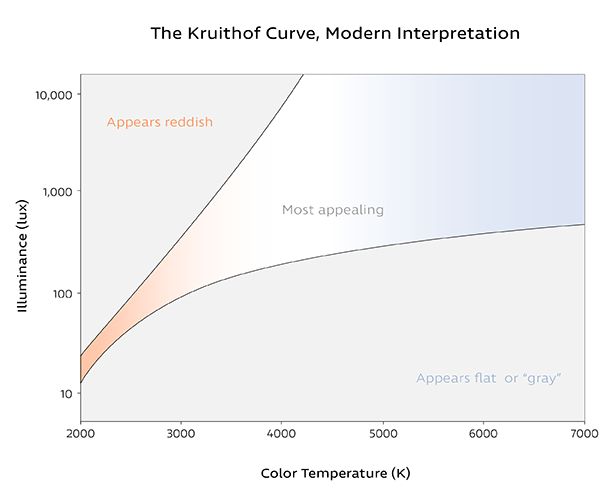 Further, in order to emulate the amber shift, the color must be tuned as it is dimmed - a capability that is unique to full spectrum lighting solutions like Ketra. Ketra is uniquely calibrated to maintain its candlelight warmth over its lifetime. Every Ketra lamp meets the correlated color temperature and tuning requirements to produce a warm candlelight glow. Our multicolor light source combines all of the colored LEDs, so that when the light is emitted, it always appears as one uniform color. Our proprietary, intelligent driver chip and LED module addresses the challenges of color mixing and color maintenance to deliver high quality light that maintains precise color output - including the warmest dim hues - over its lifetime. To learn more about Ketra’s award-winning lighting solutions, reach out to one of our specialists today by completing the form below.